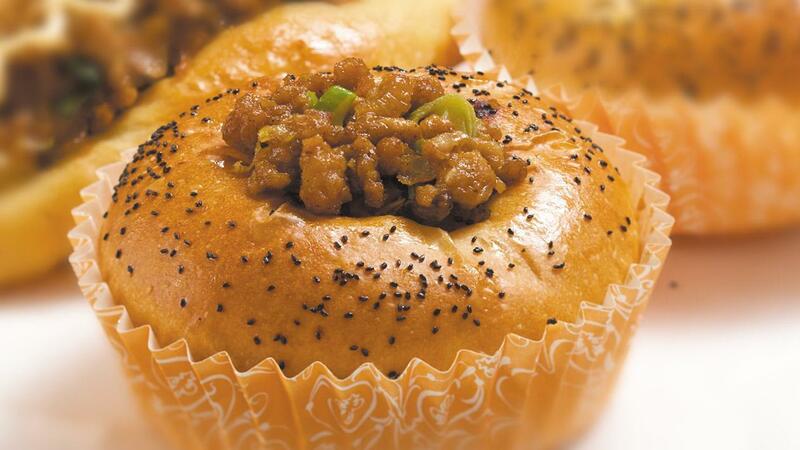 One of the most popular chicken dishes in Asia filled in a bun will be a perfect snack in the afternoon. Mix all dry ingredients and pour the water, margarine and egg yolk. Mix them well and ensure they are not sticky anymore. Leave the dough in a table for about 15 minutes. Weight the dough and form it into a ball. Leave the dough again for about 15 minutes. Form the dough as you want to and leave it in a proving box. Ferment the dough until the are expand (for about 1,5 - 2 hours) and bake at 190⁰C - 200⁰C for 15 minutes. Heat margarine and sauté garlic and onion until they are smell well and add the chicken. Mix them and ensure the chicken is cooked. Then, add the rest of filling ingredients except the flour. Before move it into a plate, sprinkle the pan with the flour and mix them well. After the temperature is getting lower, add the filling into the sweet bread and form it as you want to.